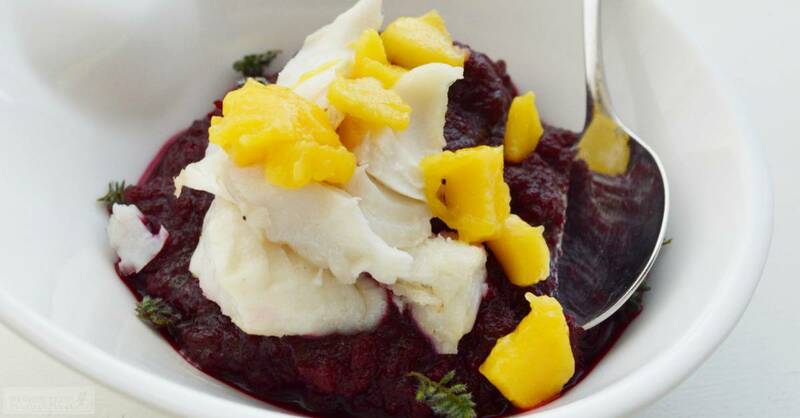 This haddock with beet puree is sure to wow with its bold colors and hardy veggies turned airy! 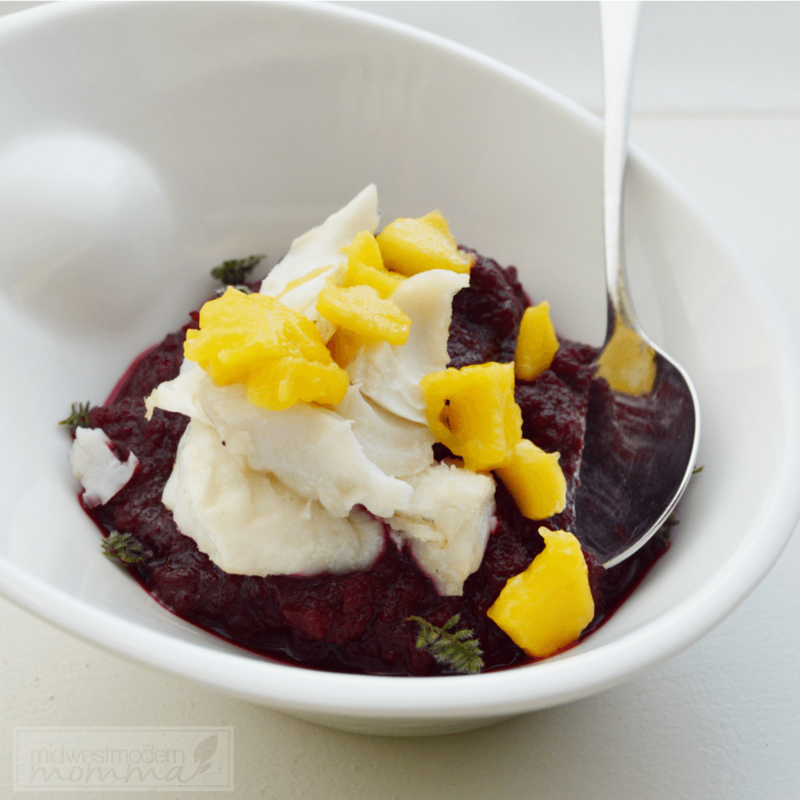 My boys love the combination of the fish, mango, and pureed veggies. My mom has a weird fear of mixing fruits and veggies, but she'll eat it without the mango. We try to have fish at least twice a week for a few reasons. I can normally find great deals on white fish (Haddock and Cod are two of our favorites), it's great brain food, and the kids love it. Plus I have a sensitivity to chicken protein that makes my autoimmune flare like crazy & I struggle to find enough protein in plant-based sources to keep my body functioning like it should. 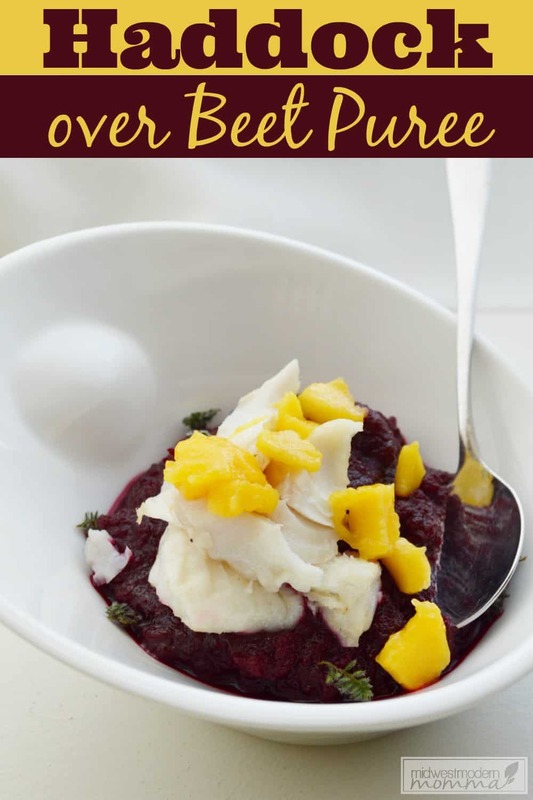 This haddock over beet puree is a delicious Paleo recipe that works for those avoiding red meat and even Pescetarians! 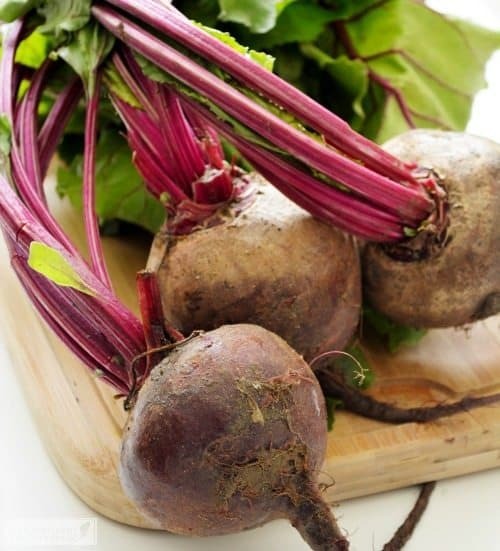 Start by gathering washing your beets really well and then peeling them. Cut off the very top and the root. Now gather all the rest of your veggies, washing them well, and tossing them into the steamer basket. Make sure to cut everything so that it will cook evenly, since you want it all fork tender. It takes about 18 minutes in our steamer, but each one is a little different so keep an eye on it the first time. While the veggie mixture is steaming, heat a pan for your haddock to just under medium. Pat your fish dry – I used to skip this step, but it really helps your fish cook properly! Add the olive oil & fish to the hot pan and cook for about 3 minutes on each side. Add in a little fresh thyme when you flip it over. When the veggies are done, transfer to a deep mixing bowl and use a stick blender, food processor or blender. Mix, pulse, and/or puree until you reach the consistency of your liking. 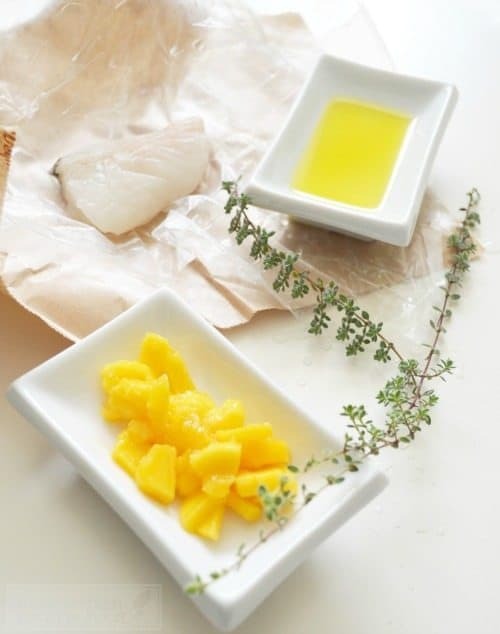 Add to serving dishes, top with haddock and sprinkle with fresh thyme and cold chopped mango. 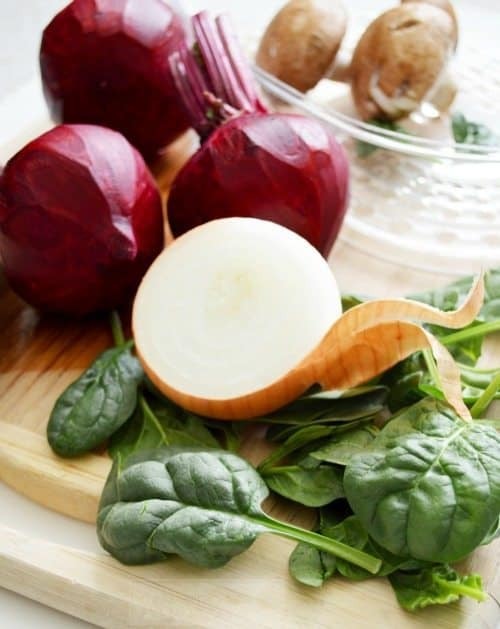 Thoroughly wash your veggies before chopping; then add to your steamer basket (all together). 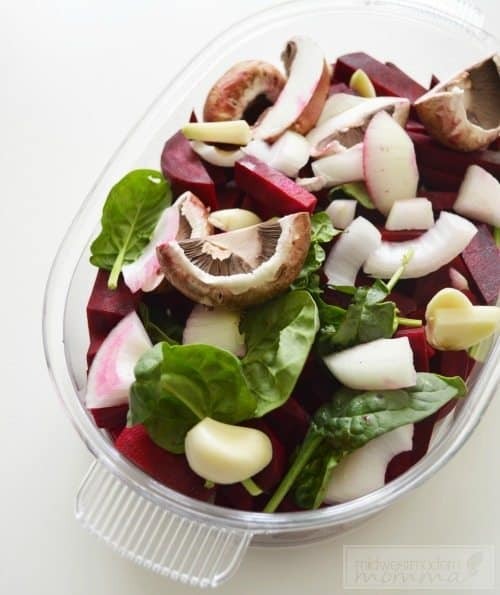 You will want everything to cook through until fork tender, especially the beets, so keep this in mind when cutting so things will cook evening. Steamers cook differently so check occasionally. It was about 18 minutes in our steamer. While the veggie mixture is steaming, heat a pan for your haddock to just under medium. Add olive oil, fish and cook for about 3 minutes on each side. Add in fresh thyme when flipping to the second side. *Please note cooking times will vary depending on the thickness of each cut of fish; please watch closely to prevent burning or under cooking. Haddock should flake when done. When the veggies are done, transfer to a deep mixing bowl and use a stick blender, food processor or blender. Mix, pulse and/or puree until you reach the consistency of your liking. Add to serving dishes, top with haddock and sprinkle with fresh thyme and cold chopped mango. What's your favorite fish recipe? Do your kids eat fish or only battered fish sticks?